Freedom of Speech, Freedom of the Press, Freedom of Religion, and Freedom of Petition and Assembly are the four parts of the First Amendment of the Bill of Rights to the Constitution. The First Amendment is considered to be the most important because it guarantees our individual personal freedoms...but which one of them is the most important to you? 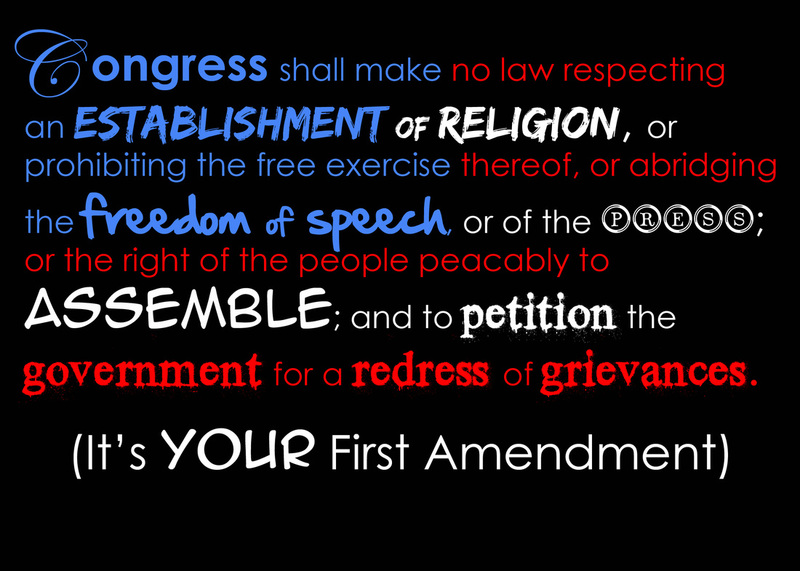 Decide which part of the First Amendment means the most to you. Do you cherish most being able to say what you feel or publish what you think? Does it mean more to you to be able to have the freedom to worship freely or gather with others to protest laws and try to get them changed? Post below which of the four parts of the First Amendment is the one that is closest to your heart. You can write about more than one. Talk to your family about what your values are. Think about what we have learned in class. Use those experiences to formulate your opinion. I look forward to reading your posts! Remember to follow the Blog Expectations on the right and STAY ON TOPIC! This week, we learned about the motto of the United States: E Pluribus Unum. That's Latin for "Out of Many, One". This motto shows the world that as Americans we may come from different cultures, religions, and ethnic backgrounds but we join together as one united country. This idea led me to think about our fifth grade class. Could we say E Pluribus Unum about ourselves? Out of many students, are we one? Why is it important that we let our differences as people make us strong? Post your thoughts below. Remember to follow the Blog Expectations at the right. I look forward to reading your posts! Only make posts about the topic!!!!!!!!!!! How do you separate Freedom of Speech and Freedom of the Press from Social Media? Are they one and the same? Where do we draw the line? However, with rights come responsibilities. How can we balance our First Amendment freedoms with today's seemingly limitless technology? What about privacy? What do you think about how Freedom of Speech and Freedom of the Press relate to outlets like Facebook and Instagram? Post your thoughts and as always, please follow the Blog Expectations. 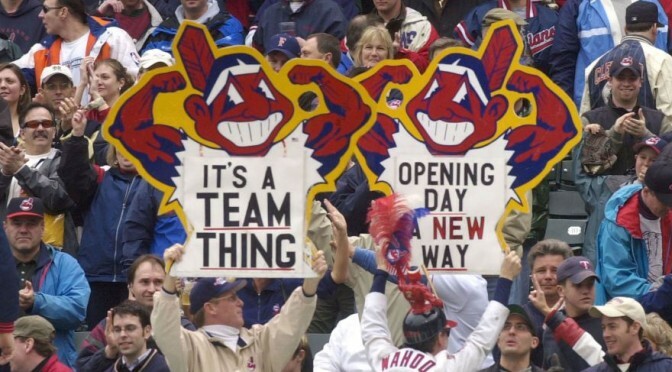 These sports fans proudly display their Native American mascot at a recent game. Do you think this is offensive? Why or why not. As we wrap up our study of the Land and People Before Columbus, we discussed the controversial issue of Native American mascots. We watched a video clip about Charlene Teeters who attended graduate school at the University of Illinois and began a campaign to educate people about the Native American perspective of how mascots portray their race. The owner of the Washington Redskins, Dan Snyder, appeared in another video clip declaring he would never change the name of his team because it conveys "...honor and respect..."
What do you think? Are Native American mascots offensive or are they a time-honored tradition that is not meant to harm or be prejudice? Why are there no other mascots in sports that portray racial and religious groups? Should Native American mascots be changed or left alone? Are Native Americans being too sensitive or do they have a valid point? Post your thoughts below. I look forward to reading your thoughts. This blog will remain up through Christmas Break. 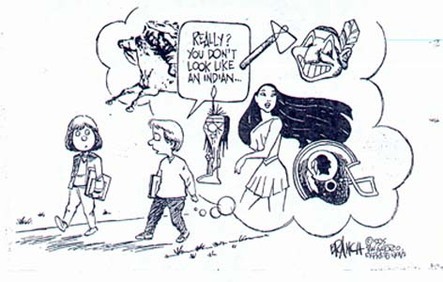 A newspaper political cartoon asks us to imagine other races as mascots. Does this change your perspective? Formulate an opinion about this cartoon. Do you agree or disagree? Are sports mascots the only media that may contribute to the Native American mascot debate? What about Disney movies? What's your opinion? The Northwest Coast Indians carved symbolic totem poles as part of their culture. Totem poles were often the result of an entire tree being cut down and transformed into a work of art. Sometimes totem poles reflected a family's history and sometimes they told a story. Most often, the totem poles showed the protective animal spirit of a clan or individual. This animal spirit acted like a "guardian angel" does in the Christian religion. Many Native Americans would wear an amulet around their necks or carry one with them. This was a pouch in which signs and tokens from the person's totem spirit was kept.Totem spirits choose the person by making themselves known throughout a person's life in a special way. My totem spirit is a bear. When I was a little girl, I had a teddy bear I could not be separated from. I still have him, 42 years later! Throughout my life, I have identified with the attributes of a bear. They are very protective of the ones they love but will only fight if provoked. They are slow and love warm places they can curl up and nap. Bears are nurturers and take care of the weak among them. They are strong and brave. 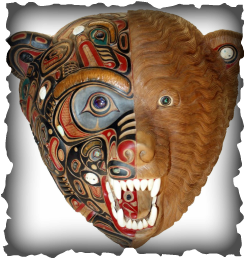 Those with the bear totem are said to be natural leaders and healers. So what do you think is your totem spirit? Think of an animal you feel may have chosen you. This should be an animal that appears in the wild. Domestic pets like dogs and cats are very common and usually aren't totem spirits unless you don't have one living with you. Here's some links to help you decide what your totem spirit may be: http://www.spiritanimal.info/animal-meanings/ There is even a quiz you can take to help you decide. It may be accurate and it may not. Remember, your spirit animal chooses you, so think of an animal who has made a constant reappearance throughout your life. Pictured above are the Mesa Verde pueblo ruins in Colorado. The Anasazi were the greatest civilization of the American southwest. They were a very strong and hearty group of native people who withstood the trials of living in such a dry and unforgiving land. The pueblo ruins of Mesa Verde, Colorado demonstrate the architectural abilities of the Anasazi as well. 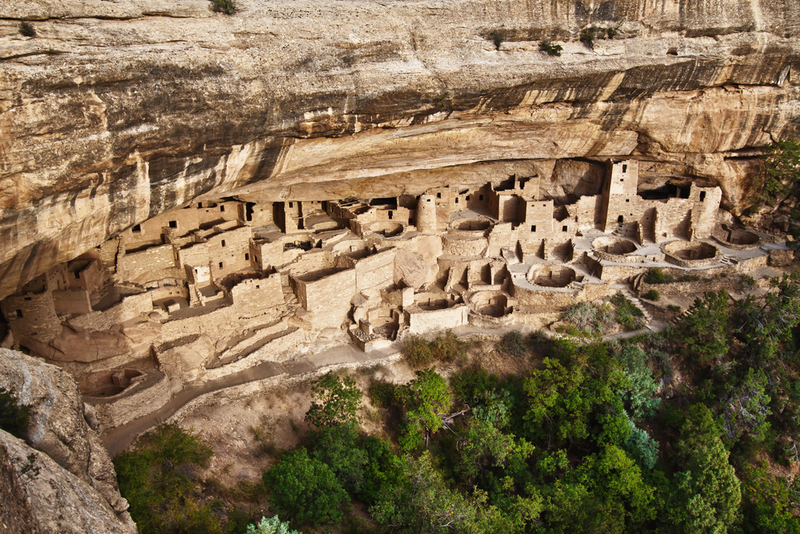 Built into an overhang of a steep cliff, Mesa Verde is as much a mystery as it is a marvel. Before Mesa Verde, most Anasazi lived on the desert floor. So why then did the Mesa Verde Anasazi labor so hard to create such a hard to reach dwelling? Were they hiding from something...or someone? Did the hunters become the hunted? What do you think happened to the Anasazi people? Evaluate what you have learned about them in class and post your opinions below. I look forward to reading them! As we study ancient civilizations in the Americas, there seem to be more questions than answers...and the answers lead to more questions! For example, what's the deal with the artifact above on the left? 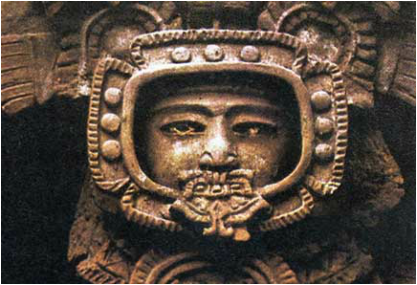 Is it an ancient astronaut? An Olmec clown? Is there any way to tell for sure? Some scientists believe something called the Ancient Astronaut Theory. They believe that ancient cultures were visited by travelers from other galaxies, sharing technology and culture. Since the people visited were primitive by our standards today, they made carvings and other artifacts reflecting the visitors in the best way they knew how. The Ancient Astronaut Theory is just that-a theory. As we have discussed in class, the theory could be true or it could be bologna. What do you think? Could the artifact above be an ancient astronaut? I can't wait to read your thoughts. Evaluate this artifact. Is it an ancient astronaut? Recently, a baby mammoth was found frozen in an Ice Age era glacier in Siberia. The mammoth was removed by scientists and studied as seen in the picture above. Members of the Chinese scientific community want to begin trying to clone the mammoth using DNA recovered from the baby mammoth's bone marrow. This has scientists and religious leaders across the world in an ethical debate. Should extinct animals like the mammoth be brought back from the dead? On the other hand, should we accept that some animals may have gone extinct for a reason? After all, just because we can do something doesn't always mean we should...or should we? Post your thoughts about the ethical question of cloning a mammoth below. Remember to follow the expectations on the right. After a long winter and a tough school year, summer has finally arrived! When the snowflakes and ice were falling, it seemed as if this wonderful time of year would never come. Now, it's here! 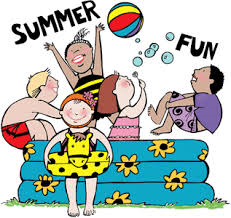 I'd love to hear from you about how your summer is going! Whether you are an incoming or outgoing fifth grader or even a student from many years past, post your comments below. Just make sure to follow the expectations on the right. Parents are welcome, too! This Social Studies Blog will be a regular part of Social Studies class for new fifth graders and their families. Is your family traveling this summer? Send me pictures and I will post them. Are you just lounging by the pool? Are you an outgoing fifth grader with some advice for the class of 2015? Post all your ideas, thoughts, and comments below. I can't wait to hear from you! 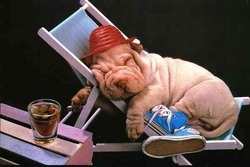 :-) I wish you a long, happy and restful break! We now turn from North and South America and the Land and People Before Columbus to Europe and enter the Age of Exploration. As we travel back in time to this exciting era in history, we will also face a dark side. There was a clash of cultures and ideas between the Native Americans and the explorers whom they encountered. One group was hungry for gold, God, and glory. The other was a peaceful people who had deep love for the environment and peace. 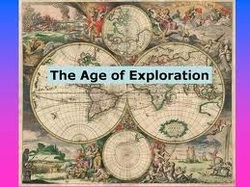 As we study the category of the Age of Exploration, use your Jot Thoughts pages in your notes and post them here. I would love to read your comments! Need something to keep you busy over the break? Remember the atlatl? It was a spear thrower used by Paleo-Indians. Below is a video clip showing it in use. One of the guys makes one just like the Paleo-indians did. You can make one, too! However, you need to ask an adult for help because you may need to use a knife. Here's a link to how to make an atlatl: http://www.primitiveways.com/atlatl_branch.html. If you make one, email pictures of you using it to me and I will post them on this blog! (This website won't allow you to post them yourself.) My email address is melody.isaacs@anderson.kyschools.us. Happy atlatling and fall breaking! This blog is now closed to comments. Thank you so much for your questions and comments! Please check below for answers to your questions. We are living in the year A.D. 2013...or 2013 C.E. The First Americans may have crossed the Bering Strait land bridge more than 15,000 years ago, or 15,000 B. C. E. or Before the Common Era. The choice of which of these time references to use is one of great debate. As we learn more about the Land and People Before Columbus, post your thoughts about measuring time on timelines using B. C.-Before Christ- and A.D.-In the Year of Our Lord- or B.C.E. or C.E. What do you think about Beringia and the other theories as to how the first people came to populate the Americas? 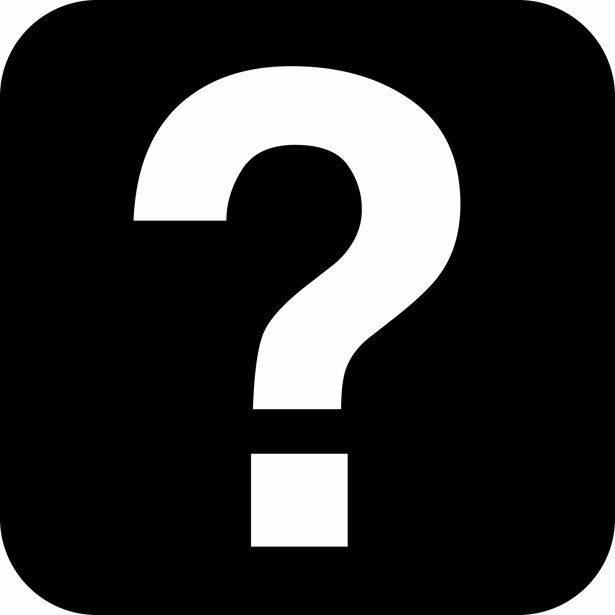 If you have questions or comments during class we do not have time for, post them here and I will try to answer them. Keep track of your ideas in your notes on the Jot Thoughts pages. Until next time, embrace the past and reach for the future. Happy Blogging Fifth Grade Class of A.D. 2014 C.E.! Source: United Kingdom Daily Mail Newspaper-Provided As A Reference Not As An Endorsement of C.E. and B.C.E. In class today, we learned there are three types of resources: natural, capital and human. Natural resources are things in nature for which people have found use. This blog will be about natural resources. Natural resources like coal and oil are fossil fuels, which means there is a limited amount of them. After they run out, there is no more. Since we have based most of our energy needs around these two types of natural resources, what will our world do when they run out? This probably won't happen for many more hundreds of years, but it 99% of all scientists agree that it will happen. Your grandchildren's grandchildren may very well face some "Energy Blues". Today in class we learned that primary sources are original records of an event. We looked at a replica of a Mayan pot or vase showing a popular athlete of the time. At the left you will see an actual picture of that artifact. We also looked at other examples of primary sources like photographs of ancient Indian temples. If you would like to know more about the Mayan ballgame we discussed, click on this link: http://www.ballgame.org/. We will learn about the game and how it represented the Mayan creation story later on in class. Post your thoughts about primary sources below. What are some examples of primary sources in your house? If you take a look at the link above, post your thoughts on that, too. If I share your comment in class, you will receive a banknote! :-) See you tomorrow! Until then, embrace the past and reach for the future! Wow! What a great start to the school year! I am so excited to be your teacher this year! 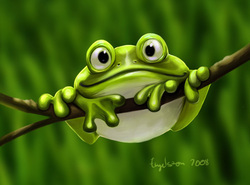 Its time to get hopping into our Social Studies E-Class blog! Let's start our blog this school year with posts about what you think about the school year so far. Are there things you are still nervous about? What are you looking forward to? Post your thoughts below. Be sure to follow the Blog Expectations at the right. Come back often and make comments about other posts. Put your best into the blog you are going to write. It may be published here! According to the Bible and history, Noah's Ark allegedly came to rest on top of Mt. Ararat in what is today the country of Turkey. Marco Polo mentioned traveling through the area in his book, The Travels of Marco Polo. Many say he claimed to see a boat-like structure atop the mountain. Since Mt. Ararat is covered in trecherous glaciers, no one has ever been able to climb to the top to find out if Noah's Ark is really up there. To complicate things further, the country of Turkey has forbidden any archaelogical expeditions to explore the area for many years. However, satellite images have shown the possibility of something peeking through the glaciers, giving a tataliaing glimpse into what may be one of the greatest archaelogical finds of all time. If an expedition did manage to reach the top of Mt. Ararat and no Ark was found, how would this affect Christianity? What would those who do not believe in Christianity do with this information? Is it better to never know if the Ark is there? Post your thoughts! Hoooooraaaayyyy! Fall Break is here! I plan to spend time hiking and snoozing. What about you? Post your thoughts and what you are up to this week below. Today, we learned about the ancient Native American culture known as the Olmecs. Scientists and historians believe they lived in Meso-America as long ago as 2,500 B.C.E. Their culture disappeared...and no one really knows why. 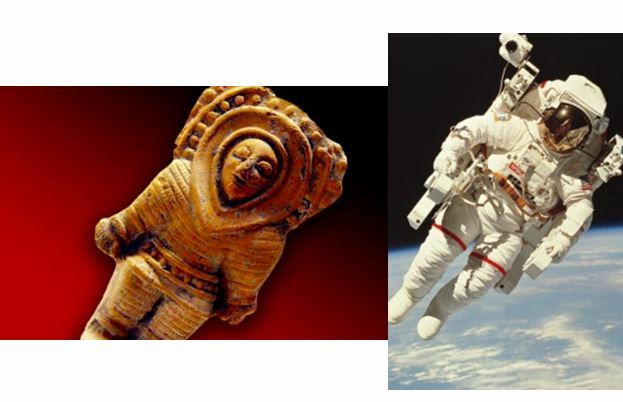 Among the many artifacts found where the Olmecs once lived was a strange figure many have compared to an astronaut from today. Of course, this figure was created over 2,000 years ago. What do YOU think this artifact represents? How do primary sources sometimes leave us with more questions than answers? Post your thoughts! I can't wait to read them! Our first Post Test in Social Studies is coming up this week. It's time to brush up on your study habits! How do you study? What tips can you offer your classmates? You already know my tip about making up silly sayings. I also suggest 15 minutes each night of quiet study time in a place other than on your bed. Your body associates your bed with sleep, so your brain may not be alert. Study sitting up in a chair that is not as comfortable and your brain will focus on learning better. Avoid having the TV or music on in the background. You may think this is "how you study" but in reality, it is a big distraction to your senses. Post your study tips below. I can't wait to read them! It's a new school year here at Emma B. Ward! Are you excited? What are your impressions of fifth grade so far? Post your comments below. Remember to follow the Blog Expectations at the right. I look forward to reading your comments! Ms. Melody Stephens is in her 21st year of teaching, 15 of which have been in 5th Grade at Emma B. Ward. The topics the author discusses in this blog are intended to be from an unbiased and neutral point of view and provide an extension of classroom instruction. 1. Show respect for cultural diversity. 3. Stick to the topic...posts off topic will be deleted. A blog is not an instant message or texting outlet. It is a written conversation among a group of people. 4. Post only appropriate comments. Inappropriate comments will be deleted and the IP address of the computer used to make the post will be traced. 5. Consequences for inappropriate posts may range from surrender of ALL computer privileges for the remainder of the school year to even a report made to police.